My good friends, Tia and Doug Walters, tried for over a year to conceive. They were elated to announce in January they were expecting a baby, due in late July. At 19 weeks, they were thrilled to find out they would be having a son. His name is Lucas. At the original anatomy scan, Lucas was being stubborn and the tech couldn't get the proper pictures of his heart, so they were asked to come back. They returned the following month, and the tech still couldn't get good pictures, so they were sent to Seattle Childrens Hospital for another ultrasound. It was during this visit that their entire world was turned upside down. The ultrasound showed that Lucas only has two heart chambers, instead of four. His congenital heart defect is so rare that it doesn't even have an official name. Every step of the way they are learning something new, but what they do know is that Lucas will require multiple open heart surgeries. The first one could be almost immediately after his birth, and the others shortly to follow. In early adulthood, it is very likely Lucas will require a complete heart transplant. Per the request of Lucas' cardiologist, Tia will relocate to Seattle one month prior to her induction date, while Doug stays home and continues to work. Once Lucas is born, Doug will be unable to work for some time, as him and Tia stay with their son. Depending on his condition, he could be required to stay in the hospital for many months. Leading up to the time before Tia relocates, they have multiple appointments and ultrasounds scheduled in Seattle. I am asking that we come together and help relieve some of the financial burden Tia and Doug will acquire during this already stressful time in their lives. 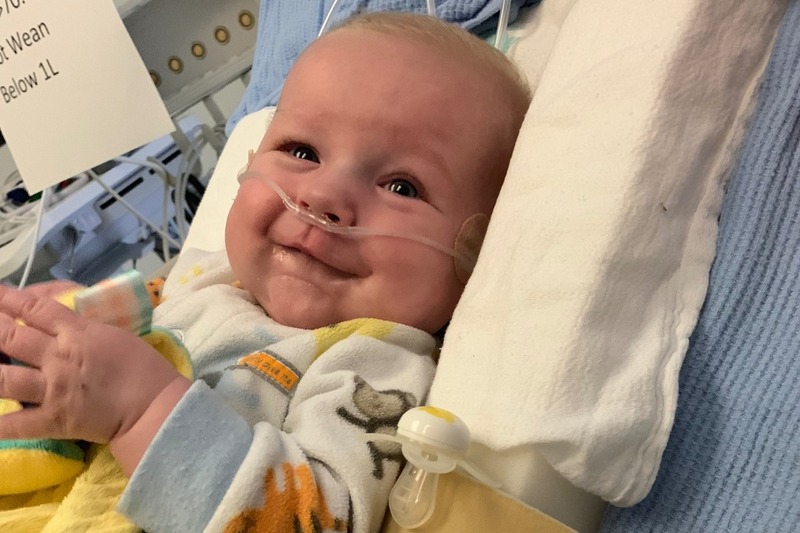 Money will be used for the cost of travel and food, and once Lucas is born, to help pay for his multiple surgeries and extended hospital stay. It will also help their loss of income while Doug is unable to work. You all know as much as I do that Tia and Doug are amazing people and do not deserve to go through this, but they are strong and will not give up on Lucas. ANY amount helps so that they can put all of their focus on their baby boy. Please refrain from bombarding Tia and Doug with further questions, as this is an extremely difficult time. Updates will be made as new information is learned. Thank you for your prayers, support and hope for Lucas. Lucas just went back to the OR for emergency surgery! He was recovering slowly from his 4th open heart surgery on Monday & when the nurse was removing one of his chest drain tubes part of his stomach lining came out with it. Please pray for this little warrior. He has been through so much, too much, in his 4 months of life. Tomorrow Lucas goes in for his 4th open heart surgery! This surgery was supposed to be the 2nd surgery in his stages surgery plan so mom & dad knew this procedure had to happen before he was even born however he has had two unplanned surgeries in between his first one & now. 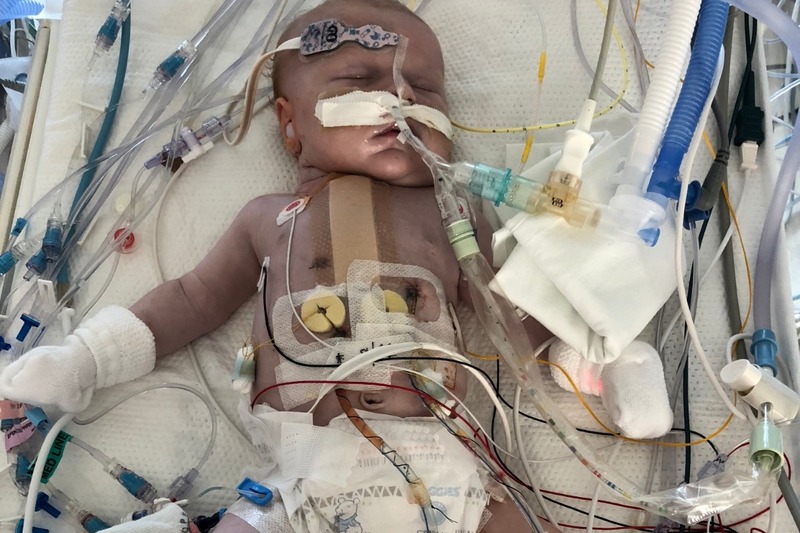 This surgery is coming a couple months earlier than the doctors had wanted but Lucas is unable to keep his oxygen saturation at a life sustaining level so they have no other choice but to operate a little early. Please pray for Lucas, his parents & his medical team! Since Lucas' first open heart surgery on 7-30-18 he has really been through the ringer. After 2 & a half weeks of hard recovery, delayed sternal closure, pain medicine withdrawals & more he was days away from leaving the hospital when the doctors found yet another issue with his heart that they say happened after the first surgery. They needed to go in & do another open heart to fix the arch of his aorta. The 2nd open heart surgery was over on 8-16-18 & hopefully Lucas would be on the road to recovery once again! He fought through a partially collapsed lung after the 2nd open heart surgery like a champ & was also battling with a femoral artery blood clot. A few days after his 2nd OHS again something didn't look right on his echo. So again the doctors went in with a heart catheter to see what the problem was & this time the space between the first "fix" and the 2nd "fix" was narrowed & needed corrective surgery. For a 3rd time in Lucas' first month of life he was going under for yet another open heart surgery. 8-24-18 Lucas came out of his operation where the surgeon basically scraped all the work he did in the first two OHS & made a completely new "fix". Lucas is currently 3 days post-op from his third open heart surgery & he is struggling, but who wouldn't be after enduring so much in such a short time. Lucas still has a blood clot in his femoral artery (left leg) & now he also has one in his jugular vein. He is currently on a paralytic medication because his little body is working so hard to heal itself. Lucas still has a very long road ahead of him as these last two procedures were not even in his plan of care & he still has TWO MORE open heart surgeries that are planned for later on in life. Please continue to pray & keep him in your thoughts. He is a fighter for sure but he is tired. Lucas was born on July 24th 2018 & had his first open heart at just 6 days old! He is recovering well at this point! Thank you for all the donations thus far. We are not out of the woods yet as he is still in the CICU. Please continue to keep our family in your thoughts!